I like opening an old book and finding an old book mark that offers a few clues about the book's provenance. Or opens a window into a community's history. Recently, I purchased Author Hunting: Memories of Years Spent Mainly in Publishing 1897-1925, by an Old Literary Sportsman Grant Richards, Coward-McCann, Inc., 1934. That is the complete title and unusual byline. I didn't discover until later an old book mark buried deep somewhere in the 319 pages. 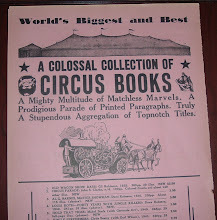 It was from Pillot's Books, Stationery, and Gifts in Houston. As book marks go, this is a nice one because of all the information provided on it. 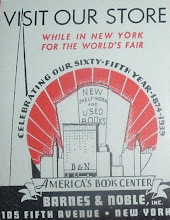 An old fashioned graphic with a subtle bookish theme starts things off. 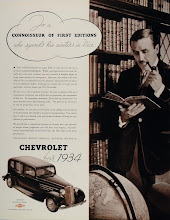 Immediately below that is a calendar month for January 1947. And below that is what appears to be a recommended reading list, phrased "Have You Read?" Some blank space follows and at the bottom is the store's name and address. The other side of the book mark lists Selected New Books, Kenneth Roberts and Evelyn Waugh being the only authors I recognize from the 10 listed. Finding this book mark in this particular book raised a few questions and tweaked my imagination. Was the book purchased from Pillot's? If so, did Pillot's stock used books, or just happened to be carrying unsold new stock from 13 years back? I purchased the book in Houston at a resale shop. The book mark and book's subject matter helped me to imagine that the previous owner was a bibliophile to some degree and a long-time Houston resident. I also imagined that person had either passed away or had to leave home for assisted living or or a nursing home. I thought of the book achieving some rank of seniority on the home library shelves, having resided their since its new owner arrived home with it from Pillot's in 1947. When I found the book, its companions on the resale shelf appeared to have a common theme--an A. Edward Newton title, an introduction to typography, and a few other book-related titles from the 1930s-40s. I bought them, too, but found nothing in them to associate them with the Grant Richards book. Still, I assumed a common previous owner. 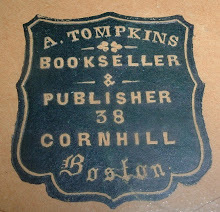 Sometimes I feel a kindred spirit with the previous owner of an old book or batch of books I come across. In this case, I can assume with reasonable certainty that the previous owner(s) cared about books and bookish topics and treasured their books. I can honor that by finding a good home for them, either on my shelves or those of someone else appreciative enough to buy them. Then there's the graphic at the top of the book mark. A man in old fashioned attire (Victorian?) trudges through the snow carrying a book. I imagine the message having something to do with the importance of books to the extent that braving the elements is a small price to pay for the joy and reward of a good book. What I do know is that it does not depict January in Houston. What I don't know is whether Pillot's book marks featured a unique design for every month on the year. I assume they did, and I would like to see them all for that year and any other years that they did that. Who knows how long it will take to find another, or if I ever will. Never seems more likely. I know that Pillot is an old name in Houston's history. Pillot-Henke was a major grocery store in Houston, primarily in the first half of the 20th century. I knew nothing of a book store by that name until I found the book mark. And there's a scant trace of evidence online about Pillot's Book Store at 1014 Texas Avenue. And the few references I did find both used Book Store in the name of the establishment. But you won't find that on their 1947 book mark. And so another item gets added to the research pile. It's never-ending!